Rabo Largo, meaning broad tail, are found in northeastern Brazil. They originated from fat-tailed hair breeds which were brought from Africa and crossed with the native Crioulo. They are white, pied, or white, with a colored head. Both sexes are horned. 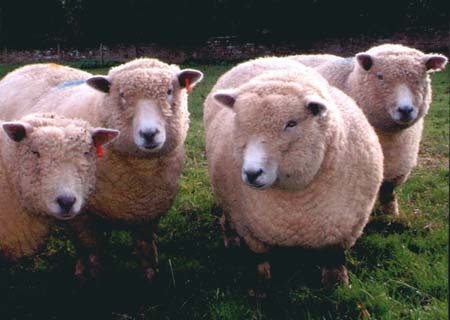 Individuals within the breed vary between hair and carpet wool. The breed is one of the long fat-tailed breeds. The cork-screw horns protrude almost straight upward from the top of the head. The Racka has been described as a hardy animal and is often used in crossbreeding due to its ability to pass this survivability to its offspring. The breeds unique appearance and quiet disposition would make it a desirable animal for hobby situations. The Rahmani originated in northern Syria and northern Turkey and was introduced into Egypt in the 9th century. The original stock is the Red Karman from Turkey. The breed is named after Rahmania, a village in the Beheira Governorate in the North of the Delta. This breed is believed to have some resistance to internal parasites. The animals breed all year round. The twinning rate is relatively high. 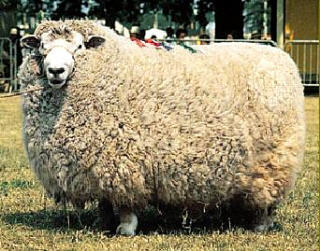 They are the largest of the Egyptian sheep breeds. 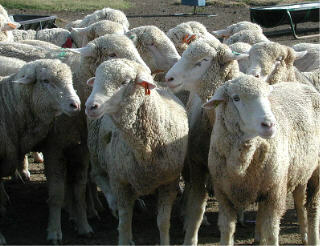 They produce coarse/carpet wool and have a fat-tail. Their color is brown, which fades with age. Though named for the town in France, the breed owes much of its development to Germany and the United States. 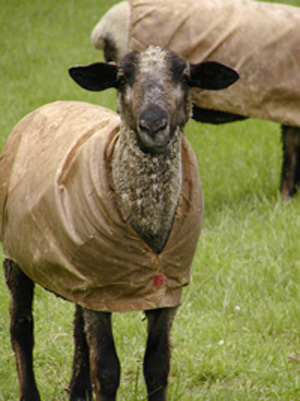 The Rambouillet is a dual purpose sheep, producing a desirable carcass and good fine wool. 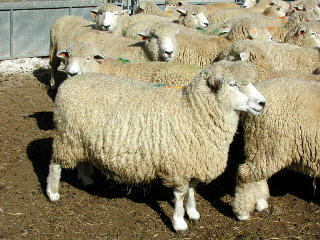 Rambouillets are large sized, rugged and long-lived with a strong flocking instinct. 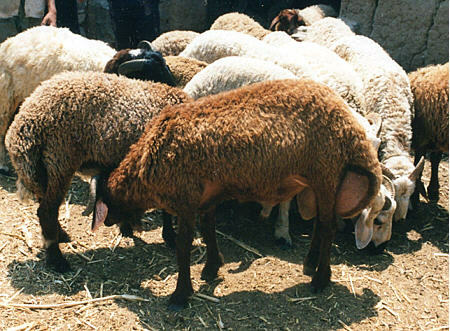 Rambouillet ewes possess many desirable traits which have resulted in their inclusion in crossbreeding programs to improve lamb production. Red Engadine sheep orginated in Switzerland in Lower Engadin and in the bordering Tirolian and Bavarian valleys. 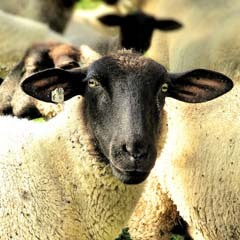 They originate from local varieties, from the Stone Sheep and the Bergamask sheep. 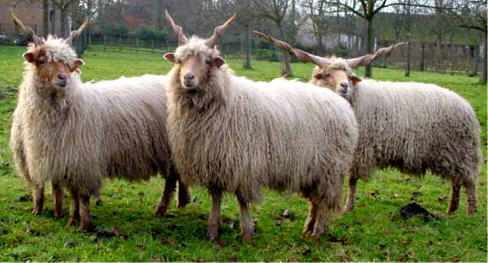 They are medium to large framed and are distinguished by their ram nose and their long, hanging ears. 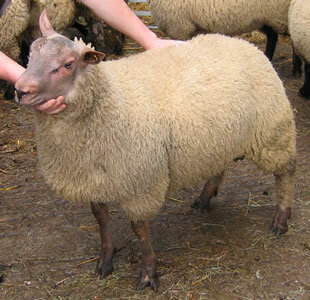 They have a dark-brown body and a red-brown, medium to coarse wool which with increasing age becomes lighter. They are an easy-care sheep, well suited to extensive production situations. In the 1980's, the breed was almost extinct in Switzerland, but conservation efforts reversed the trend and in 1992, the Swiss Engadine Sheep Breeders Club was formed. 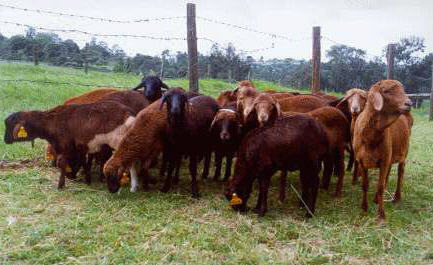 Red Masai are an East African fat-tailed type of hair sheep used for meat production. They are found in northern Tanzania, south central Kenya, and Uganda. Masai are red-brown, occasionally pied. Males are horned or polled. Females are usually polled. Red Masai are known for being resistant to internal parasites. Pictures from 1873 show that the Rhöenschaf then was similar to the one of today, despite crossbreeding attempts with Cotswold, Oxfordshire, and Merino rams. 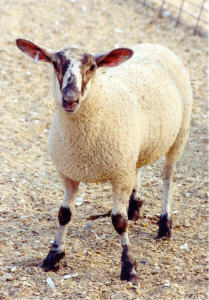 Even today it is a medium to large-sized sheep with long legs and no horns. 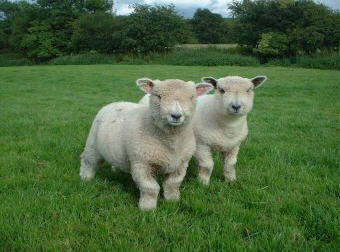 It is the only breed with white legs and black head that is free of wool. This extremely hardy and frugal landrace is well suited for the wet climates of rough highlands, where it is useful in landscape preservation. In the higher regions, the sheep feed on rough grasses and tree sprouts; in lower areas, they groom the meadows that are dotted with fruit trees. Romanov ewes tend to lamb by the litter. Most other sheep give birth to singles and twins, while the Romanov average about 2-5 lambs per lambing. When the lambs are born they are pure black but when they get older they turn gray. Romanov wool (a mixture of gray wool and black guard hair) is used for rugs, mats, and wall hangings. 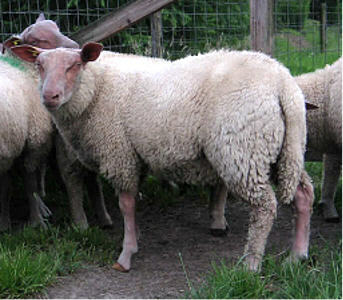 The Romeldale is a breed of sheep developed by A.T. Spencer, who felt the Romney breed would increase the staple, length, and carcass quality of his Rambouillets. Through many years of selection, the Romeldale breed was developed, with fleece properties of 60-64's, extremely high yield, and uniformity including carcass cutability superior to the other whiteface breeds. During the 1960's, Glen Eidman, a partner of J.K. Sexton, found in his purebred Romeldale flock a multi-colored ewe lamb. 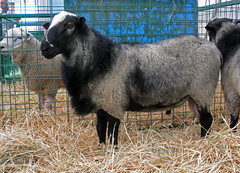 Two years later a ram lamb of the same barred pattern was born and when crossed with the ewe, the resulting offspring were of the same color pattern. Through subsequent breeding and further mutants from the Romeldale flock, the C.V.M. Breed was born. These sheep, christened C.V.M. 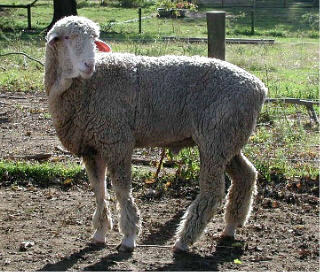 's or California Variegated Mutants, were kept by Eidman who then placed emphasis on spinability of the fleece, twinning, and lambing ease. The CVM is classified as a "critical" breed by the American Livestock Breeds Conservancy. The Romney is truly a versatile breed, as demonstrated by its ability to produce quality meat and wool under diverse climate conditions and management systems. It is so-named for the Romney Marsh region in Kent, England where it was developed as a dual purpose sheep. Due to the extreme geographic and climatic conditions of the region, Romney sheep developed some specific breed characteristics which include hooves which are resistant to footrot and fleeces which remain heavy in harsh weather. Due to similar land topography, Romneys made an easy transition to the Southern Island of New Zealand and the Falkland Islands where they quickly established themselves as the most predominant breed. The first Romneys came to the United States in 1904. 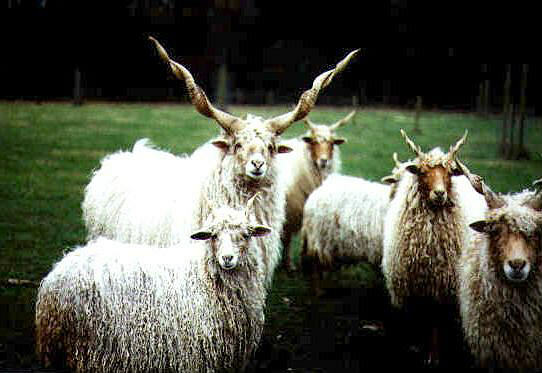 Their long, lustrous fleeces are sought by hand spinners. The Rouge is a medium sized breed of excellent conformation without excessive bone. As its name suggests, its head, which is hornless, can vary from pink to deep red and is covered with fine hair. The breed is strong and deep through the chest with good length in back and loin, but it is the exceptional hind quarters and muscling that are immediately recognized as the powerhouse of the Rouge. The Rouge de l'Ouest is of the same origin as the Bleu du Maine, but with a distinctive pink face and legs. It is used primarily for market lamb production, though was originally kept as a dairy sheep to produce Camembert cheese. However; French breeders concentrated on breeding their animals for superior conformation, whilst retaining prolificacy and milkiness. The name Rouge de l'Ouest (usually shorted to Rouge) translates as Red of the West, describing both the color and origin of the breed. The Rough Fell is an exceptionally docile sheep that excels in hardiness and has no equal in its power to exist under adverse conditions. It is well fitted to endure the hardships of the mountains and valleys of Northern England including the Lake District and the Yorkshire Dales. 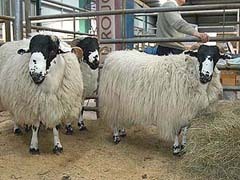 Drafted to lower ground, the Rough Fell is a dual purpose breed and is found in many counties of the United Kingdom. They are ideal for crossing. The breed has a horned black head with a definite white patch on the nose. 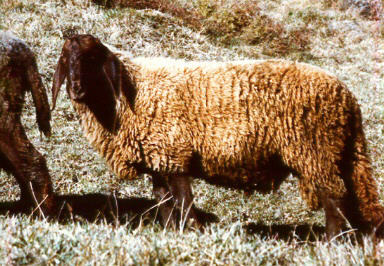 Roussin Sheep were developed from, the Brittany Heath Sheep. Dishley Leicester and the Southdown. In the 1960's the breed was improved using Suffolk and Avranchin. In 1977, the breed was closed and the characteristics established. The main areas in France the Roussin are the Cherbourg peninsular, Normandy, and Brittany. 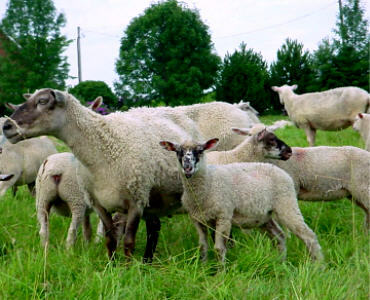 The French sheep breeds tend to stay in their local areas. However Roussin Rams have been taken down to the Carmangue to be used on the feral sheep to produce fat lambs off the salt marsh. 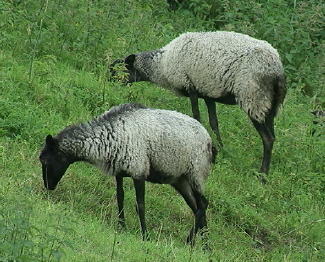 Roussin sheep are now found throughout Europe and the UK, able to adapt to any soil or climatic conditions. Roussin are hardy and prolific, capable of achieving with 200% lambing average. 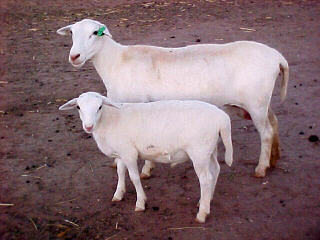 Ewes have plenty of milk and lamb growth rates are averaging 340 grams (0.75 lbs.) per day upto 100 days. Lambs finish at 18 to 21 kg (40-46 lbs.) dead weight. The carcasses are noted for their exceptional meat to bone ratio. The Royal White® is a new breed of hair sheep privately funded and developed by William Hoag, of Dorpcroix Sheep Farm in Hermeleigh, Texas. The breed is a cross between the Dorper and St. Croix. They are pure white. They grow a longer hair in the winter that is shed off naturally in the spring. 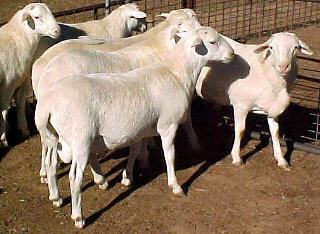 Ewes and rams are naturally hornless. Texas Tech and Texas A & M University are currently doing research with the breed with regards to meat production and scrapie resistance. Ryelands are a white-faced, polled (no horns), small to medium sized, down-type breed whose antecedents were developed by monks at Leominster in the rye growing district of Herefordshire, England, in the 15th Century. 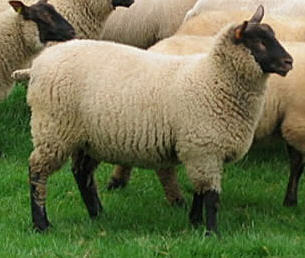 It was one of the breeds used to introduce the poll gene to the Dorset breed in the development of the Poll Dorset. The Ryeland breed first came to New Zealand in 1903 and later to Australia. 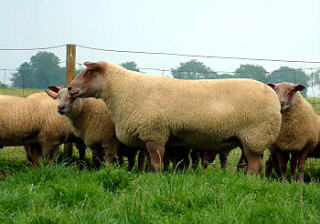 Initially a dual purpose sheep, the breed was, in latter years, used mainly as a terminal sire. There has been a recent upsurge in interest in the Ryeland as a breed ideally suited for small farmers who want the truly all-purpose type of sheep; not too big to handle safely, docile, fertile, thrifty, and capable of providing both fine wool for hand-spinning and high quality meat for the table.